A natural wood finish made for the most precious surfaces. A beautiful zero VOC wood finish for cribs. 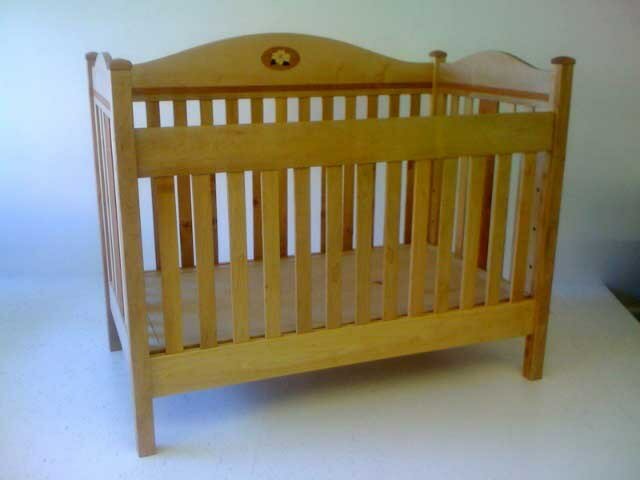 Baby Safe is an all natural wood finish that is handmade in Asheville, NC. There are no petrochemical solvents, driers, polyurethanes or other toxic additives. Baby Safe saturates raw wood with dense beeswax and a super pure oil made from the flax plant. The color of the wood is the best thing to rely on for color when it comes to cribs and things young kids use in the teething stages. Baby Safe is a purists take on crib finish. It does not rely on any color other than what is inherently provided by beeswax and filtered flax oil. This approach is recommended for those early sensitive years. As time goes on we use Bio Poly Natural and NanoTech to stain and topcoat wood safely. This allows for dozens of color options but at the early stages Baby Safe is the best way to seal a crib. Dries Naturally. No drier additives. We use two ingredients and filter out impurities and food sources for mold and bacterial growth. Silky Matte Finish, Beeswax and Plant Oils, Gorgeous! It goes far and is very easy to apply with a rag! Baby Safe meets the requirements listed 21CFR175.300(1) for coatings that may be safely used as the food-contact surface. Beeswax and Linseed Oil are Substances Generally Recognized as Safe (GRAS). Of course, we don't make our products as food but we do feel that is an ideal to aim for; a safer route to go when it really matters. The look is silky-smooth, with a great natural feel and it is achieved without any of the common poisons associated with high quality wood finishes. In one or two coats a wood toy or cutting board will be well saturated and fortified. This is partly because of the density and quality of the materials we use. Decades of wood finishing experience went into the formulation of this product and it was made with the kind of protective care that only a loving parent can offer. Two purified ingredients. Both are FDA GRAS.